For a thousand years, Serenissima Repubblica di Venezia was a democratic, independent state until Napoleon captured the city and traded it with Austria a couple of times, before it became part of the new Kingdom of Italy in 1866. Now, 89% of the 2.36m who recently voted have opted to become Repubblica Veneta, an independent state. As is often the case, taxes are one of the main issues. 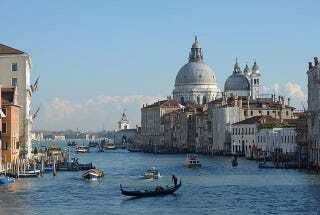 Venetians pay 71 billion euros into Italy's tax coffers, yet they only get about 50 billion in services. Northern Italy has long considered themselves richer, their region cleaner, more efficient and less corrupt than the south. The vote in Venice could just be the start, as other areas decide to join them or declare independence of their own. Though it it still is not clear how Rome will react, once Venice stops paying tax. With similar efforts also underway in Scotland, Catalonia, Basque and elsewhere, perhaps the ease of the global economy and the continent's relative peace will give rise to more nation-states or the re-Balkanization of Europe, depending on your point of view.